Well, here it is. Not my longest running ufo (that would be my partial Nicola dress that still hangs in my sewing room) but close. I started this dress at the end of November last year and just finally called it finished this past weekend. I'm still not sold on the maxi length but I'm leaving it for now. I figure I'll put this dress away now that summer is almost here and then see what I think about it when it cools down again. It's already too hot for long sleeves anyway. Pattern Description: McCalls 7242. 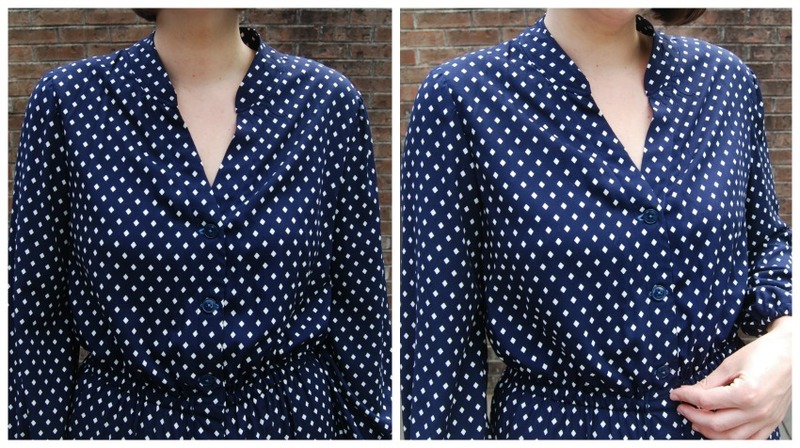 Misses button down shirt dress with elastic waist and a mandarin collar. There are length and sleeve variations. 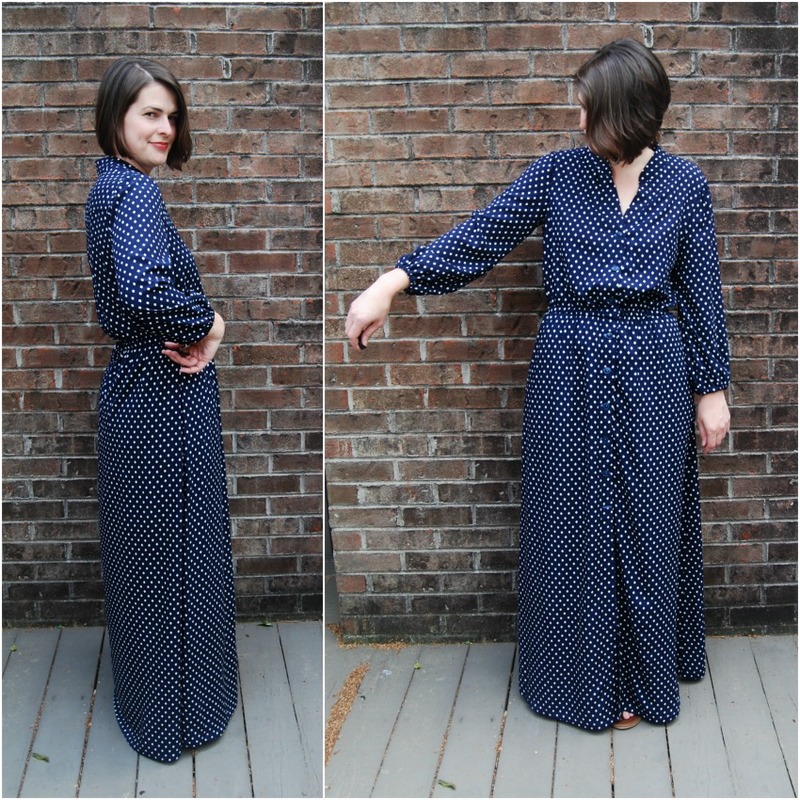 I was drawn to the 70's vibe of the maxi with the long blouse-y sleeves. Pattern Sizing: 6-22. I cut a straight size 14 out of laziness. Actually, I did a lot of things out of laziness on this dress and I can tell. I think I definitely needed a 16 in the waist and hip. And maybe even the shoulder. But the fit is decent. This is not a pattern with an obscene amount of ease like you find sometimes in Big 4 patterns. The skirt is pretty slim, which is nice. Fabric Used: I used a fabulous Cotton and Steel rayon poplin. It is seriously nice stuff. But it is on the more expensive side of the fabric I buy. I had to buy five(!) yards of it to make this dress. I really did need all that yardage, too. So this actually ended up being kind of a pricey dress. I think that's why I'm a little bummed that it didn't turn out as fantastic as I was hoping it would be. The rayon poplin doesn't have the same soft drape that rayon challis has. It's drape-y but it's also crisp, if that makes sense. I think rayon challis might have been a better choice. 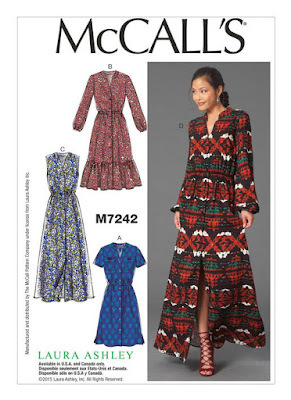 I bought the pattern when it first came out but didn't make it right away because of the yardage required. Then I saw this version by Lisa g. and this one by Sew Busy Lizzy. I was sold. I browsed around online and bought the Cotton and Steel rayon because I was making this for a special event- my school wide art show at the beginning of December. When the fabric arrived, I had exactly one week to sew up my dress. I finished everything but the collar and the finishing and lost all steam. Sewing under a deadline is never a good idea for me. I didn't finish it in time for my art show and so it sat on my dress form for several months. I'm not sure why I didn't pick it right back up after the show. Anyway, months later I forced myself to finish it. I sewed that damn collar five times (re-cutting it one time) before I got those curved front edges to match. Then I screwed up the button holes and had to fix a few by hand (they don't look good up close). And I also couldn't decide on a hem length. I almost chopped it to knee length but I decided to leave it as a maxi for now. It seems like a lot of fabric with the length and the long sleeves but I'll see how I feel later. Alterations/Deviations: After reading Lisa's post, I narrowed the front facing and top stitched it down. I also shortened the sleeves two inches at the shorten/lengthen line. I liked the big blouse-y sleeves but I wanted to be able to wear this to work and not dip my sleeves in paint. I think shortening them was a smart idea. They are still pretty big but don't billow over my hands or anything. Other than that, no other changes. 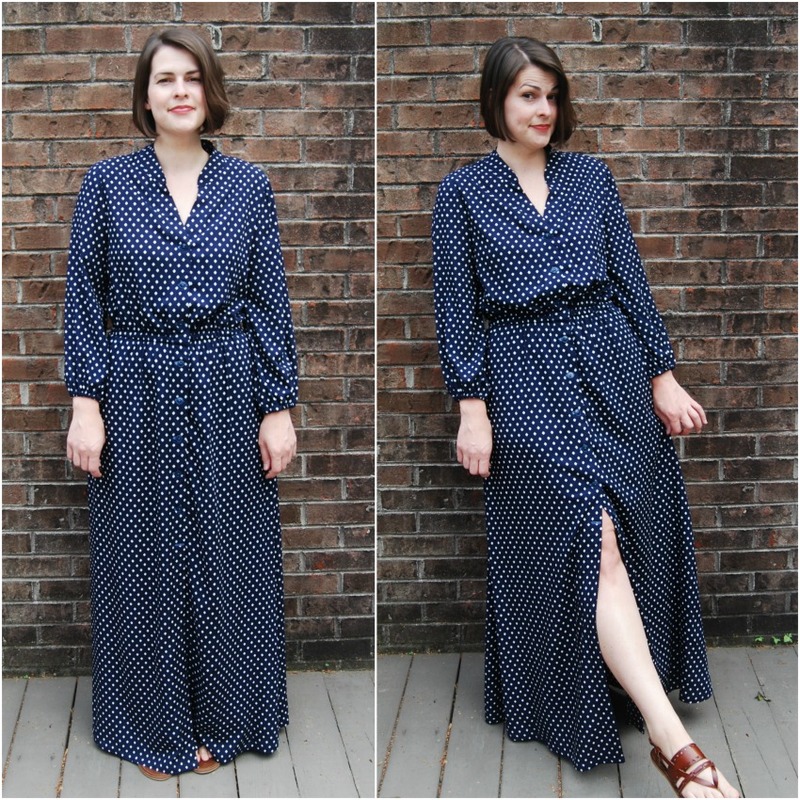 The length of the maxi is per the pattern. I could use another inch or two. I can only wear this with the flattest of shoes. Nothing with a heel or it looks too short. If you are on the taller side, you may want to add some length. Likes/Dislikes: I have some fit issues but I do like the way the collar sits. However, if there is a photo that illustrates my need for a square shoulder adjustment, it's this one below. That diagonal pulling goes all the way to my shoulders. I can feel it. I think a square shoulder adjustment (adding to the shoulder seam) would solve that. And a size up would probably help, too. I like the way the elastic waist casing is sewn as well. It's done with a larger seam allowance. You have to read the instructions carefully. Conclusion: I'd love to try this again, sleeveless for summer. In fact, I may just do that. I have a soft rayon challis in stash that would be perfect. If I make this again, I will definitely do a square shoulder and raise the armscye to match. I would also go up a size in the waist and hip and add length. I think despite my needing a few changes that this is a pretty good pattern. I'm glad I finally finished it! I really like it on you. It doesn't look like you need it in a bigger size to me. I really like the collar and neckline. Maybe not, but I do need to loosen up the elastic in the waist! If I make it again, maybe doing the square shoulder adjustment and loosening the waistline elastic will make it more comfortable. Not that it isn't now but I'm just aware of it being snug in the hip, waist and shoulder. I think I'm used to wearing big shapeless tops! I think it's great! I hope you come to love it. I totally understand the feeling of not being happy with something when you've done a lot of things out of laziness! Yes! I sure wish I had tried to line up those diamonds on the back yoke and fronts better!! Oh I love it! Everything about it! Great fabric! 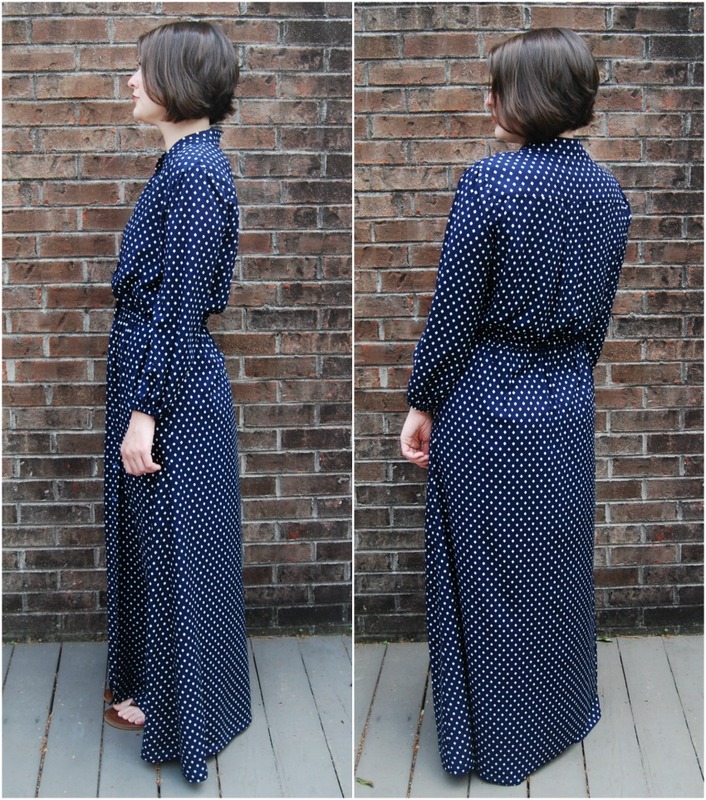 I think you'll appreciate that gorgeous maxi length and those billowy sleeves more come fall. Great art teacher dress! I'm hoping I'll have a newfound love for it come fall. Thanks! Yes, it was expensive to buy all that fabric. But I have some cheap rayon challis in stash I'd to try a sleeveless version with! Super cute on you! I like it. I think a sleeveless version will be great to have too! I love it!! It will be so perfect for fall. Definitely sit on it until fall before making any changes. And I don't see that it needs to be bigger--if you want to adjust the elastic, that's fine, but I think making it bigger will make it "too much" and it will swallow you up! This is lovely! I hope that you fall in love with it when cooler temps roll around- it's great! Oh it's lovely, the fabric is divine and the shape is flattering to you. I agree with the others that you don't need it any bigger. I love this! I loved it when you shared it on Instagram. Although I don't understand why you need to go up a size in the waist and hip. Does it pull when you sit in it? I hope you do love it more when fall comes because it's gorgeous! I think this looks really lovely on you and that fabric is beautiful!